Colored correctors. A lot of people feel they're best saved for special occasions that involve getting all glammed up, or only if you're truly going for that fully made up face. While that depends on the the user, I think including even a couple of correctors into one's everyday (or almost everyday) makeup routine can really impact the overall look. For the better, of course! I'll admit, I didn't fuss over colored correctors that often before. Rarely, in fact! Oh, trust me. I knew there were areas on my face that desperately needed it, but I figured for my daily routine it wasn't that big of a deal. That is until I started using them myself on a regular basis and now they're a must for my dark, tired-looking eyes and perpetually red cheeks. I first discovered City Color while I was still living in Tokyo and intrigued by their affordability and quality, I purchased a whole slew of products. 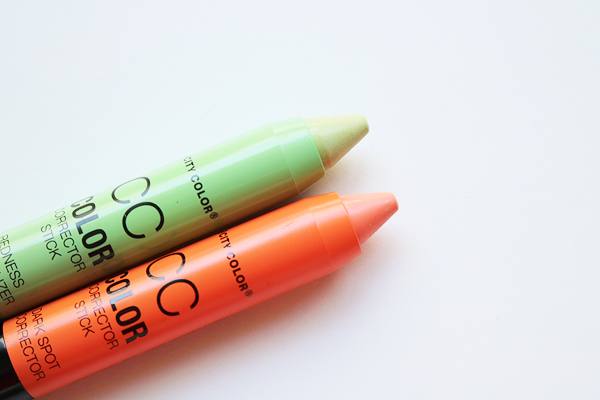 Thanks to my already well-established obsession need to find a range of good correctors, I almost instantly grabbed these CC Color Corrector Sticks as soon as I saw them. If I'm not mistaken, these are actually quite new to the Japan market and I only saw them on my temporary, return trip last April. There are four kinds available; green, yellow, lavender, and orange. I chose green to neutralize or minimize the appearance of any redness, particularly on my cheeks, and orange to correct my dark undereye area. The sticks themselves are quite 'chubby', making them easy to grip and handle. In order to get more of the product, just twist the bottom bit. While I was tempted to also get lavender to brighten up the dullness of my skin, my persistent redness and dark circles are more of a priority. The correctors are fairly pigmented and these swatches are the result of around a few swipes of each stick. The green one took an extra swipe (or two) because it's a little too light in color to pick up easily on camera. Like City Color promised, they are soft in texture and pretty creamy so they're not difficult to blend out even if you have dry skin like me. They also won't highlight dry patches provided you prep your face well beforehand with your choice of skin care products and a good primer. To use the orange CC stick, I apply it by swiping around my entire undereye area and draw a small, upside down triangle just below that area since the darkness extends out quite a bit until there. Then using my fingers, I blend everything out. You can opt to use a sponge, but I prefer my fingers. 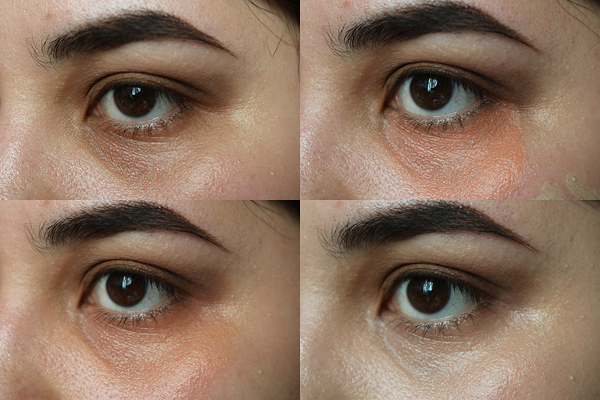 On the bottom left picture, you can already see there's a big difference in how much lighter my undereye area looks. Of course, to cover up that orange tint left behind, apply your base makeup on top along with some concealer if you want added coverage. Here I used the Maybelline Super BB Cushion which has light-medium coverage in the shade 'Light'. No concealer was added and it was set with translucent powder. I don't recommend using base makeup with only sheer or very light coverage or else you might still get some of that orange hue peeking through, especially if you apply a lot like I do. For the green CC stick, I use a similar method in applying as I did the orange one. I swipe on all the red areas I need neutralized, adding a bit more product on the redder spots like my blemishes. Using my fingers, I blend away. Lastly, I top everything off with my base makeup using the Maybelline Super BB Cushion again then set with translucent powder. While some of the overall redness has been toned down, most of my blemishes are still quite red both before and even after I put on my base makeup. At the very least, they're still a visible, pink-y shade. Perhaps if the green CC stick was a bit more pigmented it would be able to neutralize the redness more. The stick is also a bit light in shade, so maybe a green that's at least 2-3 shades darker would allow it to really correct the varying degrees of redness on my face. If you're going to use this particular stick and have similar redness like mine, you'll most likely still need a green base or primer, concealer, and/or base makeup and powder with higher coverage. 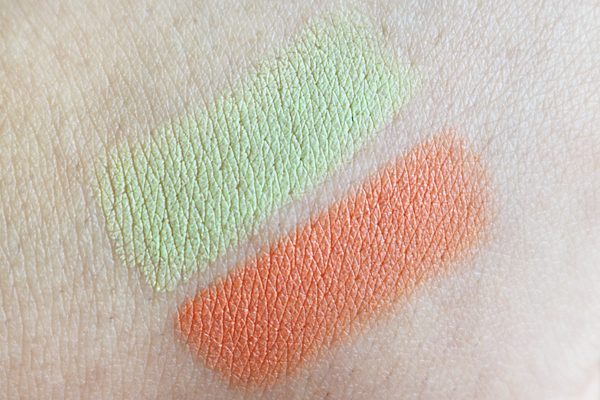 Unlike with the orange CC stick, you can use base makeup with light coverage because the green tint left behind is a little easier to cover up than the orange one. Sheer coverage makeup could still show some green though so make sure to check, using natural light is best, before heading out. While I do like both products, it might be clear already that I favor the orange CC stick because it performs more effectively for me. My undereye area isn't only brighter, but as a result, I don't look as tired and my eyes look less like your typical Tim Burton character. Although I do have some dark spots on my face as well, I haven't tried using the stick on them yet because they're currently faint enough to be covered by any light-medium base makeup. My only problem with the orange variant is that like a lot of cream formulas, it does settle into any fine lines. I have noticeable lines under my eyes, so if I tug down gently I can see some of the orange has sunk in and settled inside them. If you're in the same boat, remember to apply a good eye primer beforehand that'll be able to 'fill in' those lines before you swipe on the stick. As for the green CC stick I can't exactly fault it for not being able to neutralize all the redness on my face. After all, it was able to do it to a certain degree. I just have a lot of redness on my cheeks, more so if I'm breaking out. If the stick were darker in shade and more pigmented, I'm sure it would have neutralized almost all of the redness on my face like I had hoped. I think the green CC stick would be better suited for those with mild or infrequent cases of redness. The one con I find with this particular stick is that due to its creamy nature, it's a little 'slippery' so when I apply a concentrated amount to a (red) blemish and try to blend it out, the green pigment 'slips' off the blemish completely and I end up having to re-apply it until I sometimes give up and let it be. I have no doubt the orange stick would do so too since they share the same consistency and texture, but since I'm not applying the orange to small areas then I don't experience the 'slippage' and everything blends out fine. If you're going to be using the green CC stick, I suggest skipping 'spot correcting' blemishes. Instead, swipe over a bigger area surrounding the blemish, blend, and hope the green tint left behind will be enough to neutralize the redness. I'm pretty pleased with most of the City Color purchases I've made so far, these two included. Though the orange CC stick performed better than I expected, I'll still be on the lookout for more orange correctors to try, particularly one that is less inclined to settle into fine lines. For my persistent redness, I'll simply need to find myself a more pigmented and less slippery green corrector that has no problem staying in one spot. Available in 4 shades: lavender (dullness illuminator), yellow (color neutralizer), green (redness neutralizer), and orange (dark spot corrector). The sticks' formulas are non-drying, creamy, easy to blend, and are quite pigmented. Orange CC stick effectively corrects most of the darkness of my undereye area making it appear brighter and making me look less tired. 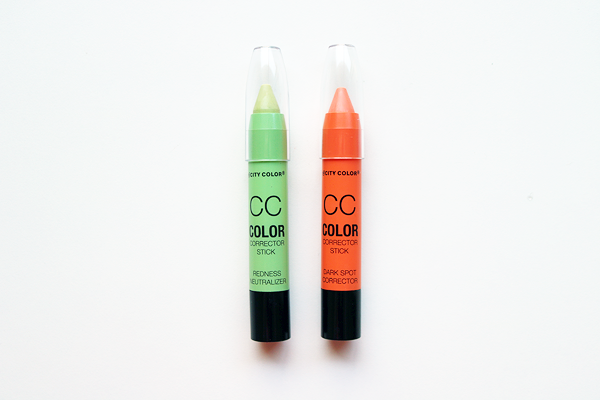 Orange CC will settle into any prominent lines in your eye area if you have them. Make sure to use a good eye primer before applying. 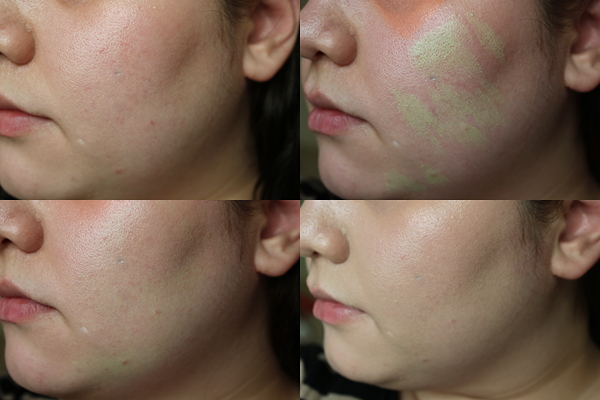 Green CC stick neutralizes some of the overall redness on my face, but redder blemishes and areas will still need a green-tinted base or primer and/or higher coverage base makeup.